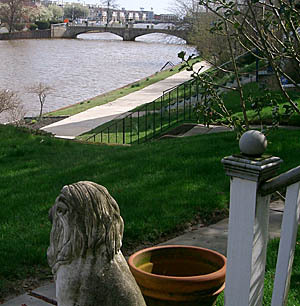 One of the historic Wesley Lake footbridges as seen from Ocean Grove in this file photo. The two historic footbridges over Wesley Lake between Ocean Grove and Asbury Park will be repaired and upgraded if the Wesley Lake Commission is successful in getting a state Department of Transportation grant. The Wesley Lake Commission is working in partnership with Asbury Park and Neptune to develop its DOT Transportation Alternatives Program (TAP) grant application to restoration one or both of the pedestrian bridges. “We are in the process of preparing the application and we need the support of both communities,” Commission Chairman Michael Brantley said. Cost estimates to repair the bridges could range from $200,000 to $500,000 for each bridge and the deadline to submit the grant is Nov. 10. TAP grants can be used for the historic preservation and rehabilitation of structures with a strong connection to transportation, including pedestrian bridges. “The longer we wait to repair the bridges the more it could cost later,” Brantley said. The bridge projects would repair the retaining wall of the northern bridge approaches, rehabilitation and resurface the concrete, restore the wrought iron railings, replace the lamp posts, and provide other landscaping and streetscape improvements. From a historic perspective, the bridges, one at Emory Street and the other at Heck Street, have been important components of both communities and the current bridges date back to 1932. Originally called Long Pond, in 1880 there were more than 500 boats on the lake and they were then one of the only the only means of transportation across the lake until iron bridges were installed later in the 19th century. Posted in Asbury Park City Desk, Shore Communities and tagged Asbury Park, Don Stine, Ocean Grove.